Welcome to the 2017/18 season of Sinfonia Chorale. We hope that despite the very mixed weather, you have all had a relaxing summer and are now looking forward to an exciting season of concert going. Having thoroughly enjoyed our 50th Anniversary celebrations, the choir are now preparing for the new season. 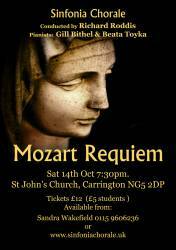 Our first concert is on Saturday, October 14th at St John’s Church, Mansfield Road, Carrington, at 7.30pm. 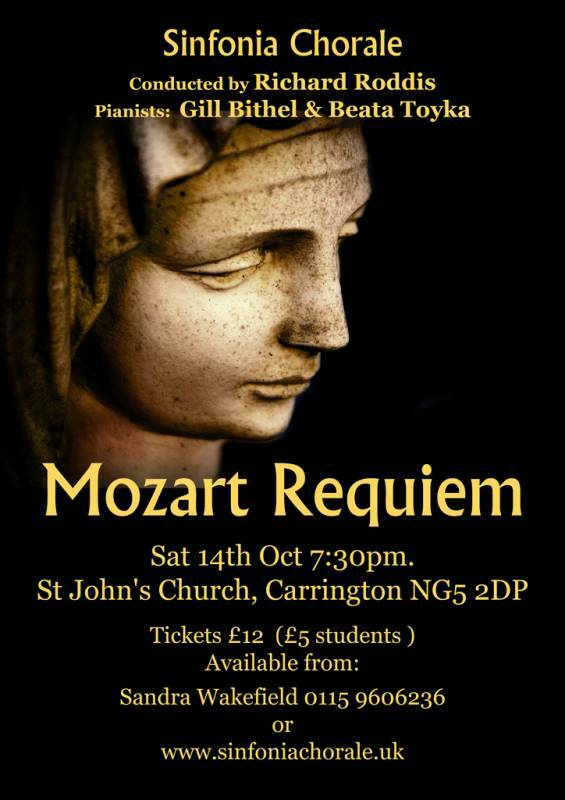 We shall be performing Mozart’s Requiem along with other choral items. The Requiem will be accompanied by piano duet in a transcription made by the great pianist and piano teacher Carl Czerny. The pianists will be Gill Bithel and Beate Toyka who will also perform Schubert's Fantasie in F minor. Tickets are £12 (£5 for students) and will be available from Sandra Wakefield Tel: 0115 9606236, via the website or on the door, subject to availability. Looking further ahead, our Christmas concert at Patching's Farm Arts Centre, Calverton will take place on Sunday, December 10th at 7.30pm. Tickets for this will be available from their website. The following Tuesday, December 12th at 7.30pm we shall give a carol concert at the Church of St. Simon and St. Jude, Rainworth. As usual, we start the New Year with our annual Come and Sing event. This will be held at Bramcote Parish Church, NG9 3HD on Saturday, January 20th. The main work for study will be the Duruflé Requiem. As usual, this work will form the centrepiece of our Spring Concert, along with pieces by Bruckner and Finzi, which will be held on Saturday, March 3rd at St. Barnabas Cathedral, Derby Road, Nottingham at 8.00pm. We hope that you will find this an interesting programme for the season and we look forward to your continued support.